what a sweet singing bird! I love they way the little bird is singing. Have a happy Earth Day and love your bird! this is fantastic, Elk! really great. Happy Earth Day to you. La, la, la, la - sorry I'm musical challenged but if you don't mind I'll sing for a good cause, just have some ear plugs handy. Love it! Happy Earth Day! sing protection and renewal into being. . . namasté. this is lovely. your creativity is always so inspiring. I love your card. 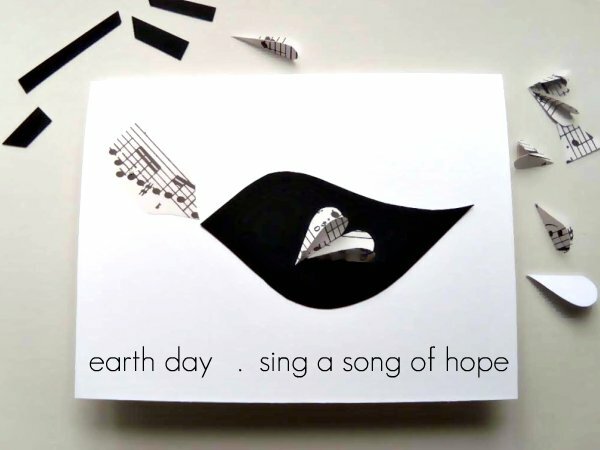 I often make cards but I didn't have time this Earth Day. happy Earth Day...late. That does make me feel hopeful! oh, the new look for your blog is great! yes, I make a habit of making my own paper. You should try it, it is very addictive, it makes you see all the paper we waste. I really like this. Really, really. Of course, I always love your birds. Your birds are so special! Hope you had a good Earth Day. Love your birds elk. And the words lifted me.